Welcome to Summer School @ The Digital Press! We are so excited to start our Summer School session with each of you. While most of our children may be out of school for the summer, we thought it would be fun to have a series of "summer school" classes for the talented members of the TDP community. 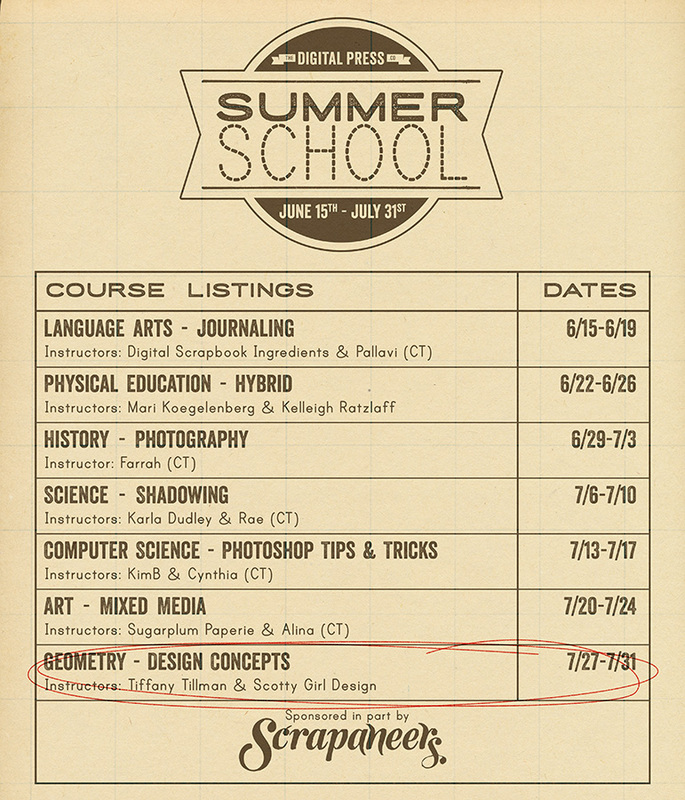 Don't worry -- Summer School at The Digital Press is ALL FUN and completely FREE! We have a great series of mini-classes prepared for you along with some very special offers in the TDP shop. Your first lesson for each Subject will be on Monday (9am EST) of that week, followed by a second lesson on Wednesday (9am EST). On Monday you also will be given a homework assignment. There is only one assignment per week... and it is due on Friday of the same week (giving you the weekend off ...just like real school!). What do you get for completing your homework on time? Each assignment completed on time (turned in by 11:59 pm PST on Friday of that Subject week) will be tallied, and is eventually worth 10% OFF one order of regular-priced product during the month of August. This means that if you complete your homework assignments on time, you can receive up to a one time 70% OFF coupon! As is also the case with our normal challenges at TDP, the Summer School assignments require 100% TDP product to qualify. With each subject, we will have a special sale that runs from Monday - Thursday on products that relate to the class. For example, the Language Arts Subject week will showcase a sale on all Journal Cards in the TDP shop. Sound great? We think so, too! But that isn't all -- Scrapaneers is also offering an EXCLUSIVE 35 % OFF discount on a few hand-picked classes each week that also relate to the subject matter. So get your mouses ready... because this is going to be a blast! Last edited by mommyish; 07-27-2015, 08:23 AM. I can't wait to play along! This sounds like so much fun and very educational! Yay! I'm so excited to be kicking things off tomorrow! I can't wait!!! I'm one of those geeky kids who was sad to see the last day of school every year. Sounds so exciting! Can't wait to play and learn! You guys are so creative! I'm lagging with my scrapping since June began but this inspires me to make time for it again. Love the chance to learn new things!! Thank you all so much for all you do to challenge us! OOO - I really want to do this! Do I have to sign up somewhere? I Saw tht the first one starts today! Last edited by pachimac; 06-18-2015, 01:31 PM. Nope! You are all set just by posting!